Last Saturday was the first time in a long time that I met the group that normally gathers at Eric's place. We haven't seen each other much since Eric left. I wonder if it's my fault or if it's Eric's. I think it's his fault. He left, not me. Haha. Well, we ( as in myself and the host ) had wanted to play Robinson Crusoe and Dungeon Petz, but somebody's boyfriend came over uninvited. :P Haha. Totally ruined our potential thematic experience ( we ended up with 5 players ). So we had to settle for a much lesser thematic fare. My plan to get Mice and Mystics to the table has hit a roadblock yet again. The first time, a new friend was invited to my place, so I didn't want to start the adventure with a group that won't be consistent throughout the campaign. Anyway, what we did play instead was a slew of games that I haven't touched for a long while. Well, excluding the obligatory plays of Hanabi which I shall no longer write in detail about; in case people start to think that that is the only game that is ever played at my place. Haha. We finished off 3 games without any great success. Nothing to shout about. 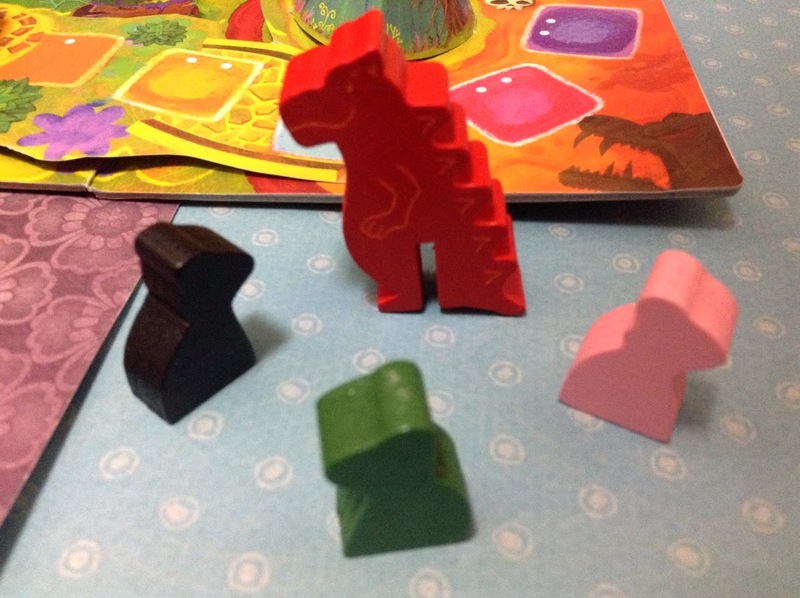 What was very exciting though was our 4 player game of Kaigan. The last time I played Kaigan was more than 1 year ago. Geez. And to think I really love the game too. It used to be in my top ten list of games, but has since fallen off. But after playing it on Saturday, I am strongly considering putting it back on the list. Every time I play it I am constantly reminded how tense and tight the game is. 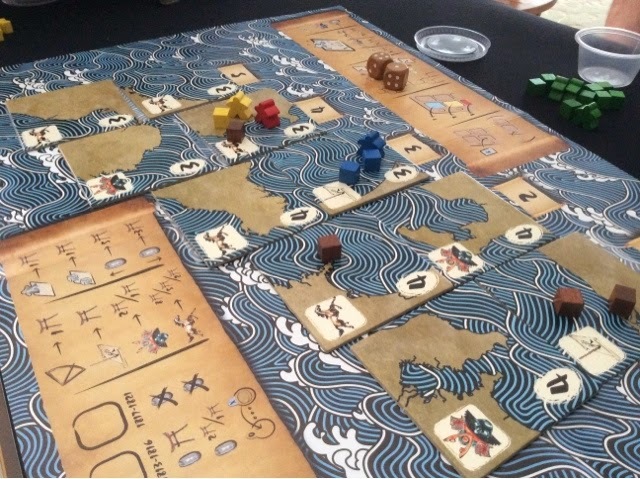 Kaigan is a game about mapping the coast of Japan. The theme is very weak if you ask me, nearly meaningless. 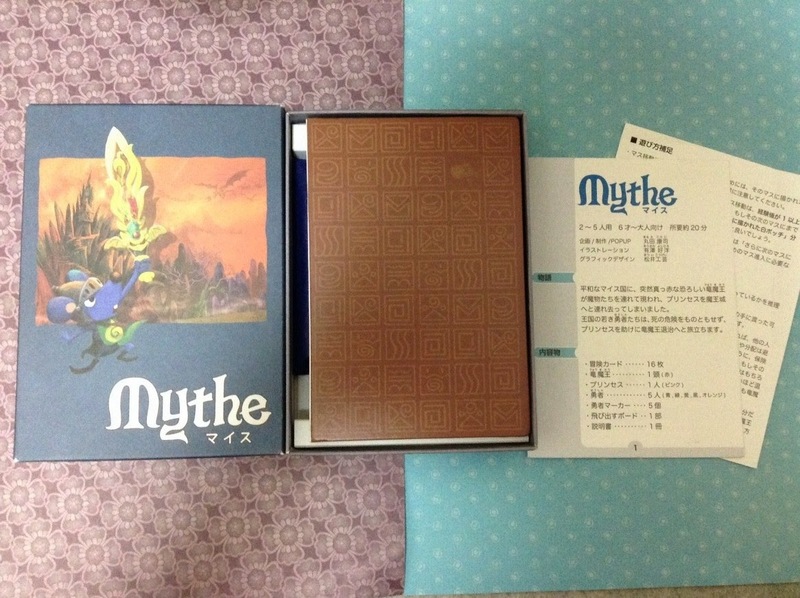 Anyway, it is played over 5 rounds, after which the player with the most points is the winner. 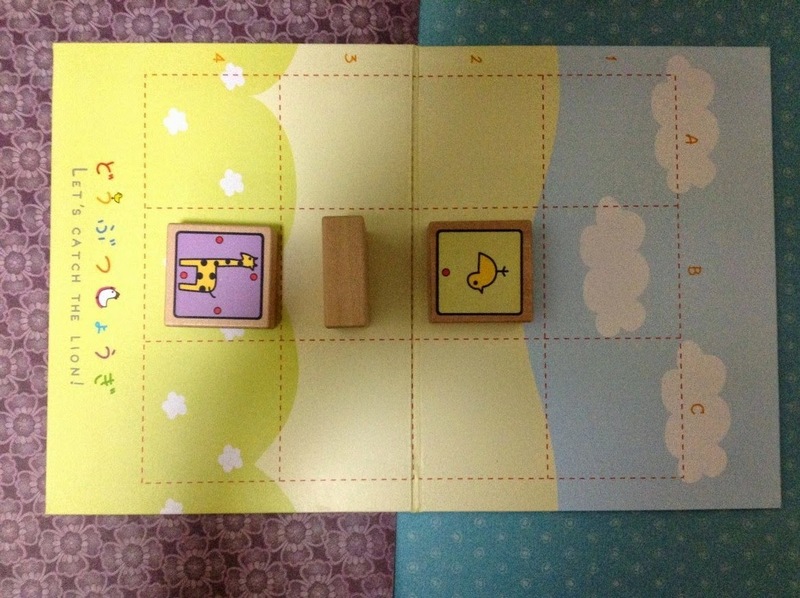 The main ways to score points are by completing map tiles and by advancing on various tracks on the main board. Completing map tiles offer you immediate points, and also allow you to immediately advance your position on 1 out of the 3 tracks (art, government, travel). Its ugly I know, but the gameplay is amazing ! I swear ! The art and government tracks will score thrice in the game, whereas the travel track only scores points at the end of the game, but with much higher returns of course. More importantly, the art and government track will give you income at the end of each round, and money is VERY tight in Kaigan. So throughout the game, players are fighting for positions on all 3 tracks and also to complete the map tiles on the board. 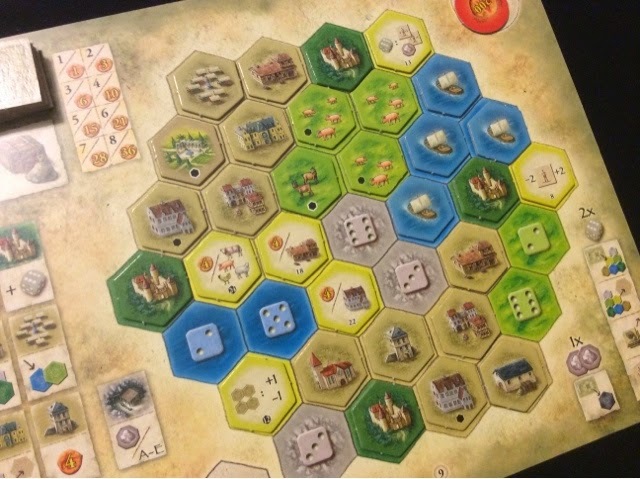 The map tiles may be completed cooperatively by players, with each reaping the same points benefits, so there can be some "discussion" to help each other out. But as we all know, this also means that there are multiple ways to lock a person out. And that happens often in the game as sharing points isn't the optimal way to go unless you are the one who reaps with lesser effort. All this sounds like a typical euro game, and it is. But the beauty of Kaigan comes in how the actions available to the players are fought over and selected. 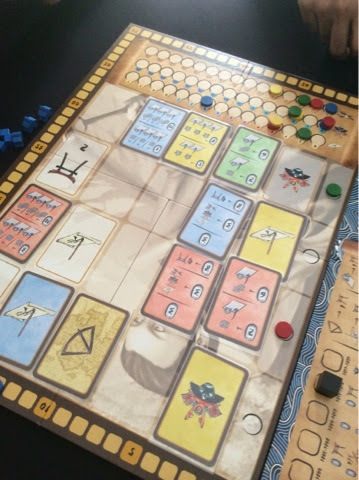 Before players get to execute any actions that aid them to complete map tiles and gain advancement on the tracks, they have to jointly fill the action selection board with action cards from their hands. 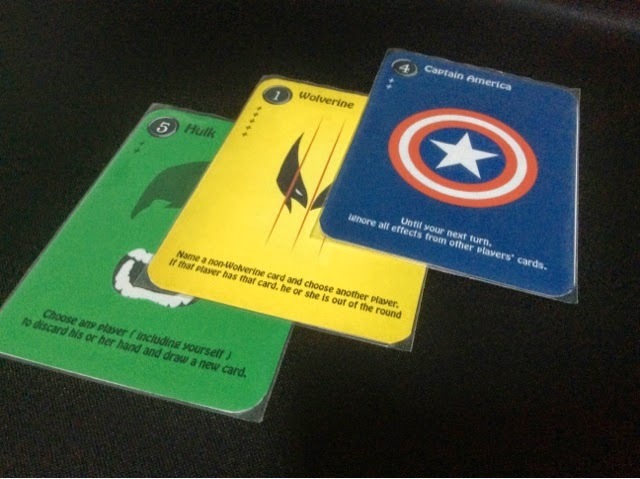 Each player has a similar set of cards in their hand, and on their turn, they must place one card from their hand onto the board. 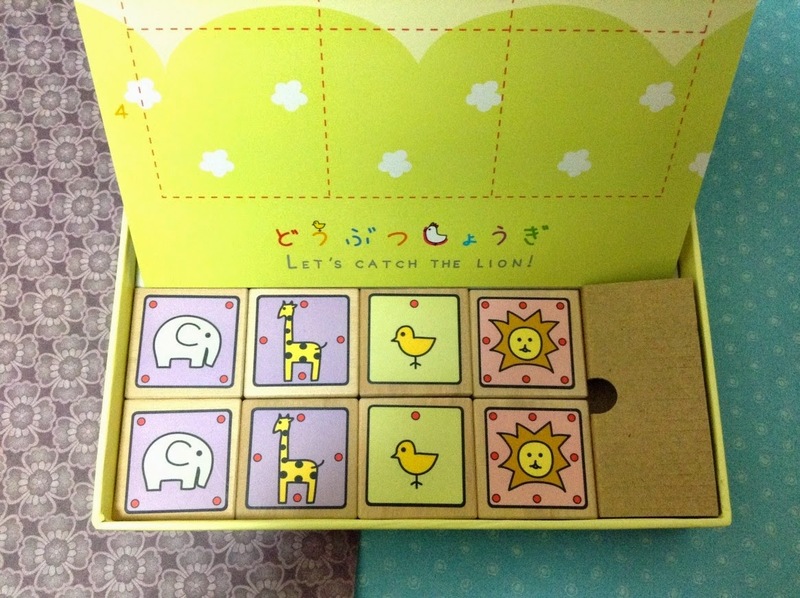 After which, the player may choose to claim a row or pass. Once the player has claimed a row, he/she is out of the round. 2 out of 4 rows have been claimed ! 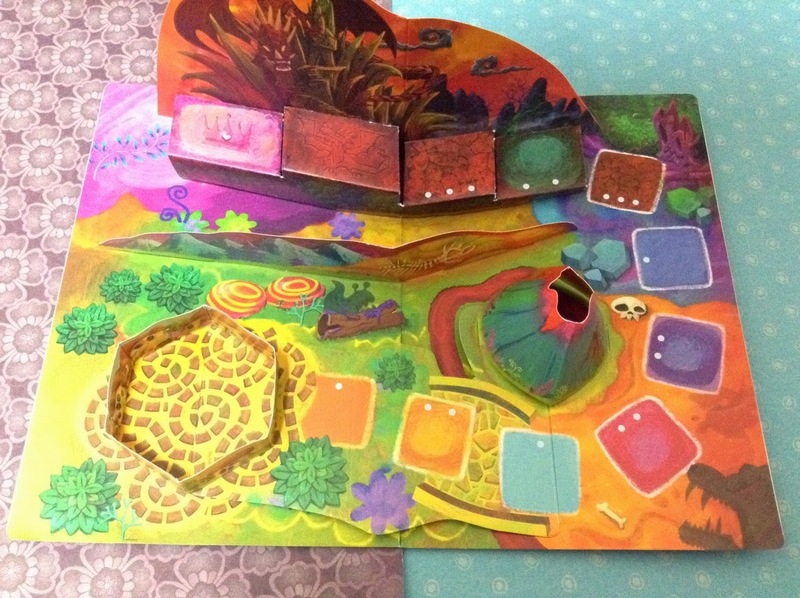 The board is a 5x4 board with spaces for action cards. Some spaces have fixed actions printed on the board. The 4 rows are completely used in a 4 player game but gets reduced accordingly based on the number of players. 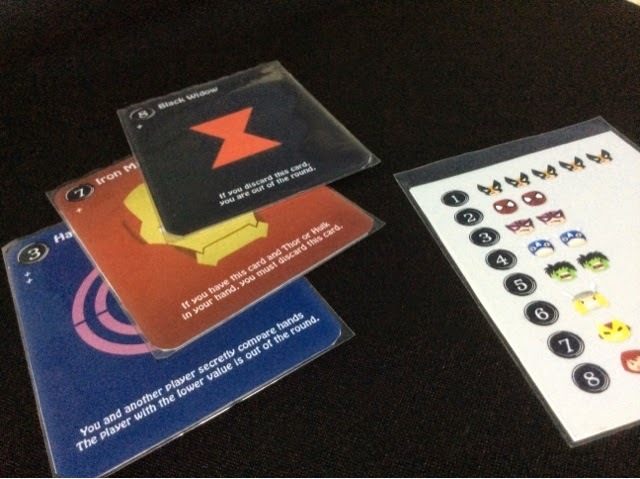 Where and when the players place the action cards on the board is the whole gameplay experience in Kaigan. Each player does not own their action card. So if it is placed in a row that is claimed by another player, that player gets to execute the action instead. 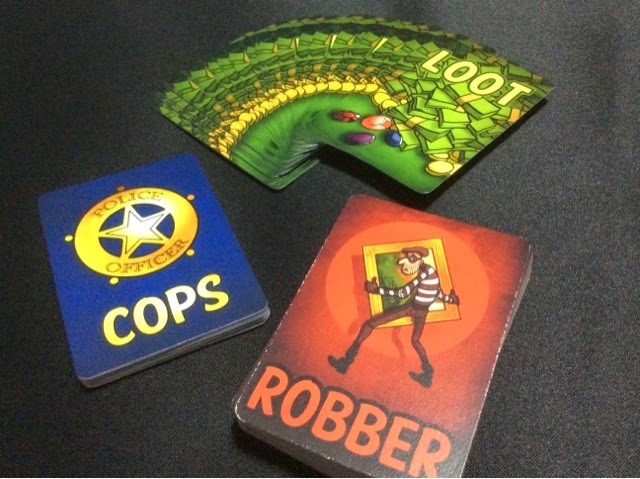 This leads to a game of chicken being played where players try to sabotage certain rows or to shoot out quickly and claim actions that will be desirable to execute their plans. Because the turn order of when the cards get executed are important, you can seriously mess with the other players by playing a less useful action in the front spaces of each row (the actions are carried out from top to bottom starting from the left column). Timing is crucial in Kaigan, so being slow to a spot could cost you the points from the successfully mapped map tile. The actions aren't very varied in terms of what you can do, but each card serves its purpose well and are vital at certain points in the game depending on what your plans are. Our game took longer than I expected, a total of 2 hours. I was the only player who has played the game before so that certainly factored into the timing. But it certainly didn't feel like 2 hours. I was completely engaged throughout. The remarkable thing about Kaigan is that the scores are usually very close, and this time was no different. First and last was separated by 8 points. But first and second was a difference of a mere 1 point (I came in second). Second and third a difference of 3 points. It could have been anyone of the top 3 to win, the last place player was certain he was out of the running by round 3. He did play poorly but he had 3 hours of sleep. So well, what can I say. I nearly edge out with the win had I claimed the 5 points for most money. But was thwarted by the last placed player who was shooting aggressively for it since there wasn't much else he could do. Still, a hell of a fun time and everyone agreed that it was a game they would certainly play again. 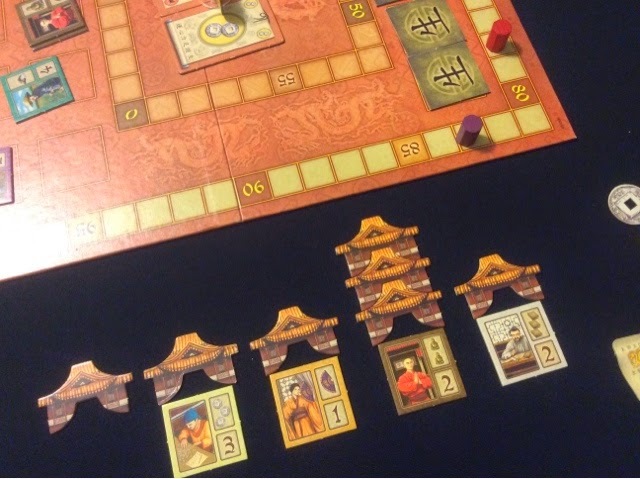 Next up was a 3 player In the Year of the Dragon. 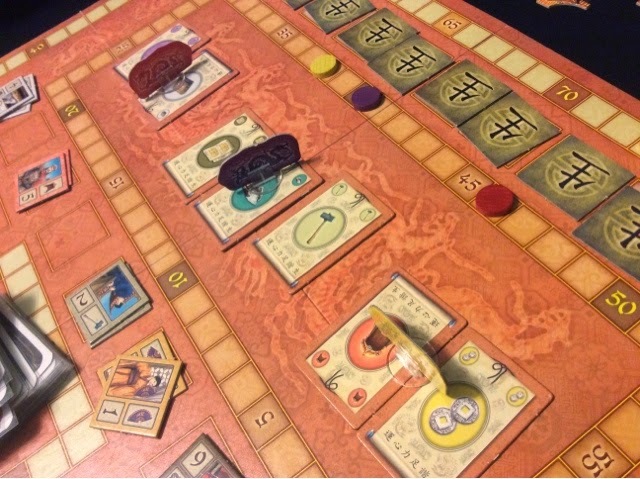 A Feld oldie that I enjoyed quite a bit when I had played it previously. Anyway, each round proceeds with an action selection via worker placement where players may gain resources such as money, or rice, or to build fireworks. After which, each player has a chance to play a card to hire a worker into his/her palaces. These workers give each player benefits when they perform certain actions. This is the engine building portion of the game. If you hired say many "accountants", instead of getting 2 coins from the take money action, you may get 3 additional coins per accountant you have. And likewise for obtaining rice, the more farmers you have, the more rice you get. Once the action is done and a new character is hired, the event for the month is executed. For whatever resources the players cannot surrender to fight the perils, they will lose a character from their palace. Points are then tabulated for the round; players score for having multiple palaces and some characters give outright points per round. That is the gist of how a round plays out. This happens twelve times and at the end of the game, players score 2 points per character still alive, and any end game bonuses to determine who is the best magistrate for the year of the dragon. Overall, I very much enjoy my plays of the game. I love balancing out how to avoid the perils or to tank it and still carry on with my plans. Some characters are only useful for certain events and once it has passed, you may sacrifice them like sheep for your cause. Trying to survive every event is possible, but never a winning strategy. Now, one (slight?) problem with the game. There is an action that allows you to buy a privilege tile that scores you points at the end of every round. You can pay 2 dollars for the single privilege tile which gives one point per round (so max is 12 points), or you can pay 6 dollars for the double privilege tile which gives two points per round (so max is 24 points). Before I purchased the game, I had heard about the double dragon play that breaks the game. This is when a player uses his/her first action to buy the double privilege. Apparently, that leads to automatic victory in the game (as long as you don't do anything foolish along the way). Now, that is 24 points, surely not game changing right? Winning scores are about the range of 85-100. Well, I have played 3 games now where the first player bought the double privilege. None of them knew of this so-called break in the game as they have never even heard of the game before I took it out to introduce it to them. So it was just simple innocent plays on their part. Results? 2 of the 3 games were won by that player. The first was rather unfortunate as I was trying to beat the break but failed because I made a big boo boo in the game that set me back forever. I mistook paying 4 coins as needing 4 rice so I lost all my people for the remainder of the game. The first game was won by the double privilege player - she is what I would say a rather total newbie. The second game I tried very hard again to beat the double privilege player again. He won nonetheless and I would say by about 10 points or so. He is probably best described as a middle level gamer. And he didn't make any mistakes during the game. The third game occurred on Saturday. I finally managed to beat the double privilege player. I squeak a win by a mere 5 points. But, he is definitely a newbie. My friend's brother who has only played the likes of Citadels and Last Night on Earth. I must mention, the first two times that I was trying to beat the double privilege, I did not buy any privilege tokens myself. This third time, I waited until the 7th round or so before I bought my own double privilege token. That was for 3 reasons. I didn't feel confident that I could overtake him without buying the token, I had much excess of money, and I waited till past the midway point of the game so that I would have been somewhat behind for a great portion of the game so as not to take away the advantage that the double privilege would have given the first player. So, do I think that move breaks the game? Well, a small yes. I think if each player is equal in their experience with the game, the double privilege at the start is a huge advantage. It can be disastrous if the tribute event is early in the game, then the player who buys the double privilege will be in some trouble as he/she will likely have no money left to overcome that tribute event. But otherwise, it is quite a handsome and easy 24 points that doesn't require any upkeep. Points in In the Year of the Dragon is hard to come by. You mostly find yourself having to work for it. And working for it means maintaining happiness and balance in your palace. But the double privilege gives you one quarter the points you need to win the game, and with no cost beyond the initial payment cost. 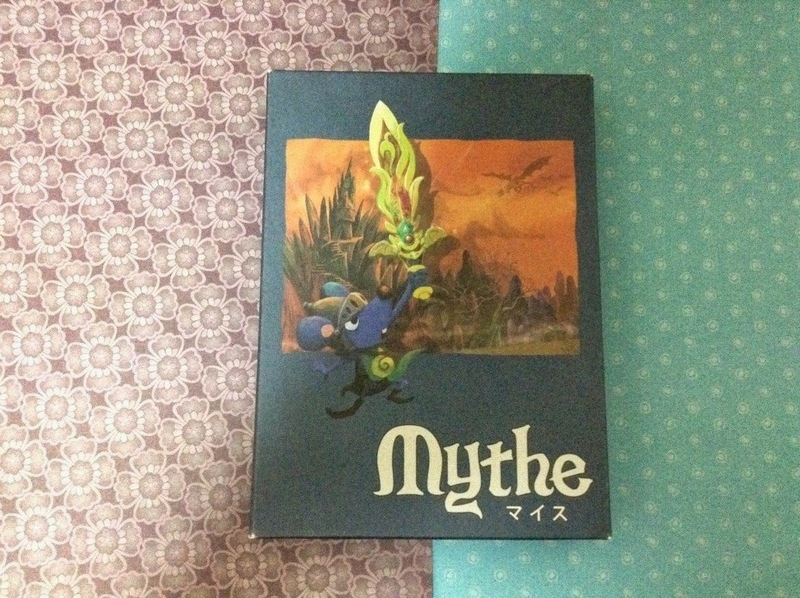 I still am eager to play the game again, especially now that I have bested it once. I am just starting to feel like I need to house rule it or to remove the privilege action and replace it with the expansion action which I have yet to play. I'll have a look on my next play what I deem best. From my previous crushing experience with 3 newbies, I decided not to be cocky and put on my "I'm gonna crush you" hat. This time, I decided to try a new strategy that involved no mines. I used an early knowledge tile to get money from exchanging a die for workers. This was to be my main source of income. And it worked ! I would have liked to have my regular source of steady income but the tile allowed me to be more flexible in my choices and I think it made a whole lot of difference. More than I had anticipated. To round up the day, we played 2 games of Love Letter. 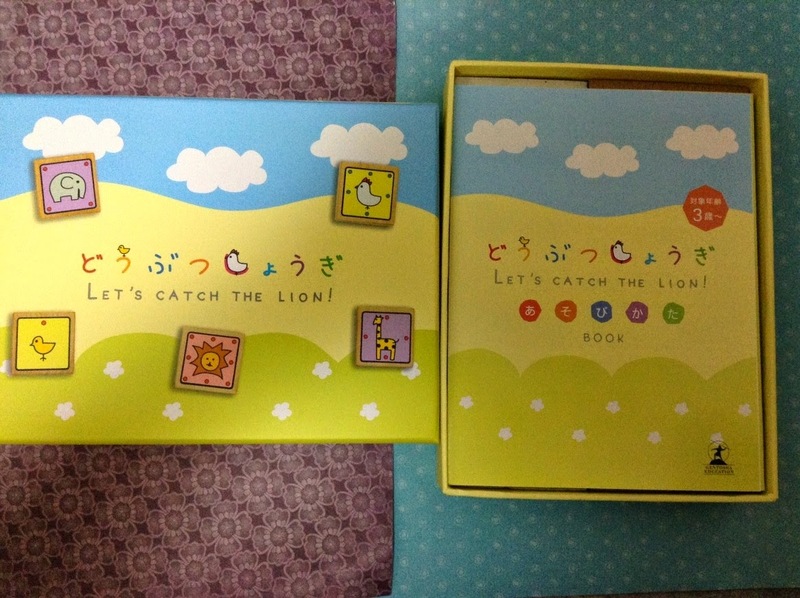 For quite some time last year, this was the most played game in my house. Well, it has now been overtaken by Hanabi - quite significantly. Love Letter used to be 20-7 against Hanabi in terms of number of plays. And checking on it now, it is 28-50, in favor of Hanabi. Explosion indeed. For some strange reason, plays of Love Letter in my house usually come down to the last and final game. Why is this strange light filler so "balanced"? Haha. It comes to the point when a game of it would take 20-30mins cos we play all the way to the final game. I'm not complaining but for a pretty random game, it never fails to amuse me how close we make the game feel. Anyway, the avengers theme is always a hit with everyone and I think it makes the game more fun than it normally is. Everytime we play it, people are shouting (literally) Spiderman! Black Widow! when using Wolverine for the kill. Hilarious. A fantastic way to end the night and maybe (just maybe) the next time, I will have a Mice and Mystics report to post. Fingers crossed. Are Games looking Less Interesting or Am I getting Less Interested in Games ? Well, we are one quarter into the year 2014 and I'm sitting in front of my office computer realizing that there are no new games that I am truly excited about or frantically doing any research on. And that, is a strangely curious thing. Coupled with my slowed down purchase rate of games for 2014, and I start to wonder to myself if I am getting burnt out with games or if its simply a case of many new releases being mediocre or extremely unappealing.